Cigarette taxes around the country are levied on top of the federal rate of $1.0066 per 20-pack of cigarettes. As of 2016, taxes accounted for almost half of the retail cost of a pack of cigarettes. On average, states charge $1.73 of taxes per pack of 20 cigarettes. 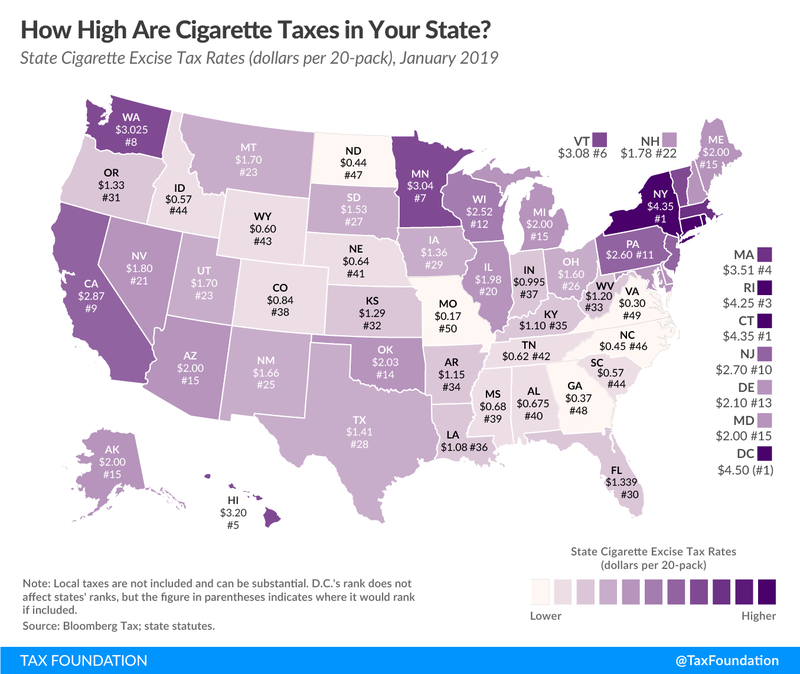 If high taxes were the goal, New York and Connecticut would be smoking the competition this year with their rates of $4.35 a pack. Rhode Island ($4.25) is close behind, with Massachusetts ($3.51) and Hawaii ($3.20) following. But not every state charges such high taxes. There is a wide range of rates in different states. Missouri, for instance, levies the lowest tax in the country at $0.17. Virginia ($0.30), Georgia ($0.37), North Dakota ($0.44), and North Carolina ($0.45) also levy low rates. When a consumer purchased a pack of cigarettes in 2016, federal and state taxes made up 44.3 percent of the final price, on average. It’s important to note that local cigarette taxes also apply in some states, even though they’re not included in this map. In Chicago, for example, the combination of state, county, and city taxes add $6.16 to the price of a pack of cigarettes. In New York City, smokers pay $5.85 in taxes alone on a pack of cigarettes. States sometimes champion cigarette taxes as a fix for large, structural problems when they face revenue shortfalls. However, cigarette tax revenue is declining as fewer Americans smoke, reducing the size of the base. This flux means cigarette tax revenue is not a reliable funding source for important policy priorities. To illustrate this point, we have built an interactive web tool that allows taxpayers to see how cigarette tax revenues have changed since 1955.